During the First World War Canon Hales (as he then was) was chaplain to the 1st/8th Sherwood Foresters, developing close ties with Newark. Later he became Assistant Chaplain to the 4th Army. He was a popular padre with the Foresters with the troops in the trenches referring to him affectionately as 'Halo'. He was awarded the DSO and mentioned in despatches twice. 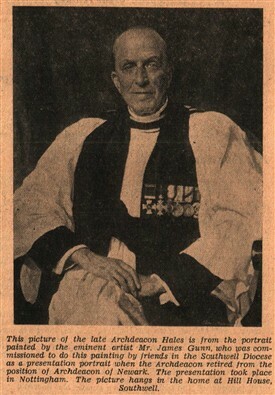 After the First World War he held the post of senior chaplain to the North Midland Division until age forced him to retire. His outstanding service in the First World War gave him a knowledge which stood him in good stead in the Second when he was a welfare officer for troops stationed in the Newark district. He was Archdeacon of Newark and served for many years as a Governor at the Magnus Grammar School in Newark and from 1910 to 1920 was Assistant Diocesan Inspector of Schools. At his home in Southwell - Hill House - he was a keen gardener and grower of carnations. John Hales was born in Birstwith in Yorkshire and educated at Winchester and Jesus College Cambridge. In his younger days he hunted with the Earl of Harrington's Hounds. He was ordained in 1893 and became curate at Plumtree in Nottinghamshire. In 1897 he was instituted rector of Cotgrave and in 1924 was appointed to be the rector of Gedling. He was rural dean of Gedling from 1929. In 1931 he became canon of Norwell Palishall in Southwell Minster. His association with Southwell Diocese then extended over some 53 years until his retirement in 1946. It was in 1898 that he married Augusta Margaret, daughter of Col. Cantrell-Hubbersty, with who he had one son, the Rev. George Frederick Hales MC, and four daughters.